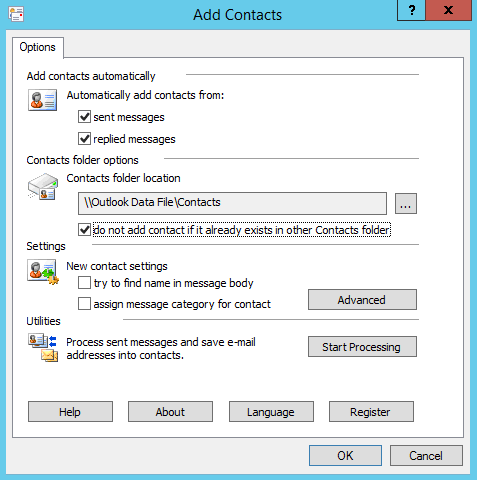 Puzzled by your Outlook not adding existing senders and recipients to the list of Contacts? The bad news is that it’s not supposed to. The good news is that it can be fixed – with the help of MAPILab Add Contacts add-in for Outlook. You can learn about its principal features in this brief overview. Adding senders and recipients to your contact list sounds like quite a basic feature, and indeed, users of web mail providers such as Google or Hotmail enjoy an automatic update of their contacts. Outlook users, however, have been deprived of this advantage as early as in Outlook 2000, and in later versions. 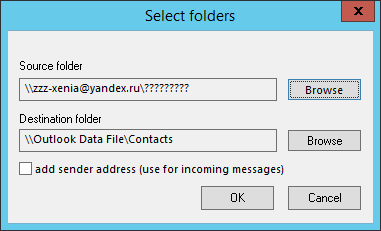 Instead, Microsoft has tried replacing it with a number of similar functions, like Suggested Contacts in Outlook 2010. This feature helps Outlook memorize the addresses and names you enter, and you can search the list later, but these contacts don’t go straight to your Contacts and you have to move them manually if necessary. Normally, Outlook adds senders and recipients to AutoComplete cache, which is relatively as handy as adding them to the Contact List, when it comes to automatic insertion of addresses in new messages. However, AutoComplete contacts can’t be managed like proper contacts or included in Rules. What is more, should something happen to the cache during a migration or for other reasons, the only option left for you would be going through your messages and right click on each and every recipient and sender to add them to contacts. However, there is a simple workaround for this functional blind spot: you can install an auxiliary tool to do the job, such as Add Contacts by MAPILab. After installation, the concise and efficient add-in will be accessible under MAPILab tab on the Ribbon, alongside other MAPLab tools, if you already have some. The add-in has only one window with a single tab to configure all of its options. First, you can choose which messages you’d like to scan for contacts – sent or received, or both. Second, specify the location for new contacts to be saved to (by default, it’s the Contacts folder of your Outlook Data File). Remember to check the box under the destination folder to avoid duplicates. Besides, you can choose any other destination, including a shared corporate folder, which is handy if you’re running a joint contact list with your colleagues. Third, the tool has a couple of extra features such as looking for the person’s name in the message body and automatic assigning of message category to certain contacts. By the way, don’t hesitate to check on the advanced settings by clicking on the respective button. Here you can configure the tool to prompt you about a new contact name both in the automatic and scanning modes as well as enter the name of the category to be assigned to new contacts. And finally, if you already have a bulk of messages you’d like to extract contacts from, it’s time to hit the Start Processing button in the main add-in window. In the appearing window you’ll be able to specify the source and the destination folder. If you are going to scan incoming messages, make sure that the senders’ addresses are included by checking the box. As a result, the add-in will extend you list of contacts by adding senders’ and recipients’ addresses, and if you have chosen prompting you about new contacts name, you will be required to enter them as the tool goes through your messages. You will then be able to see the added contacts in the selected destination. As you can see, MAPILab Add Contacts is rather a straightforward and simple solution to the lack of automatic update of contacts in Outlook.